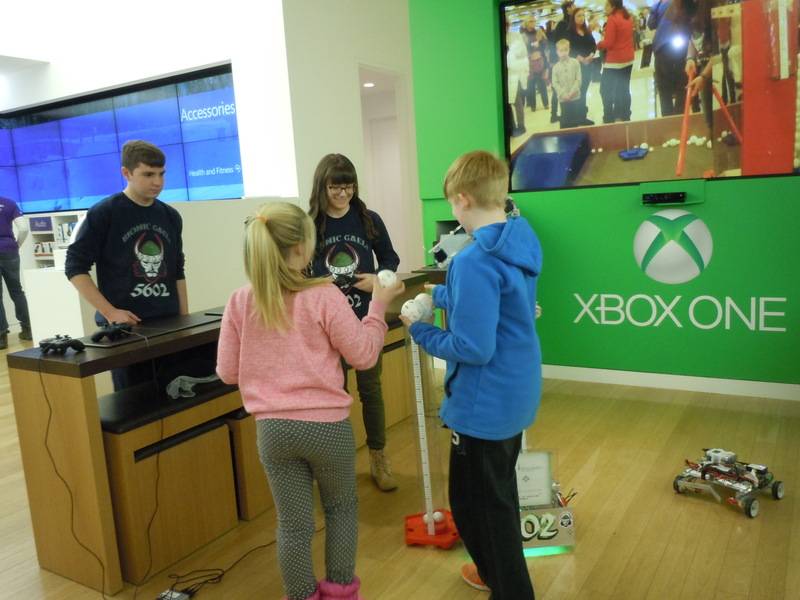 Today 2 members packed up PT-109 and kitten-bot, and hosted a demonstration at the Danbury Fair Mall inside the Microsoft Store. We had a great time presenting to the shoppers. One family already had heard of FIRST, and are planning to attend the Pi Day event hosted by our friends at Danbury LEGO Robotics! Although it was relatively uneventful, it was a great experience. Even if only that group was inspired, we consider it a success! Find more photos over on our Facebook album! Many thanks go out to the Microsoft Store! We were asking about so many different dates, it must not have been easy; yet, you still accommodated us! In preparation for the Super Regional, we’ve started the crunch time early (so maybe we won’t be sleep deprived by the time the tournament comes)! 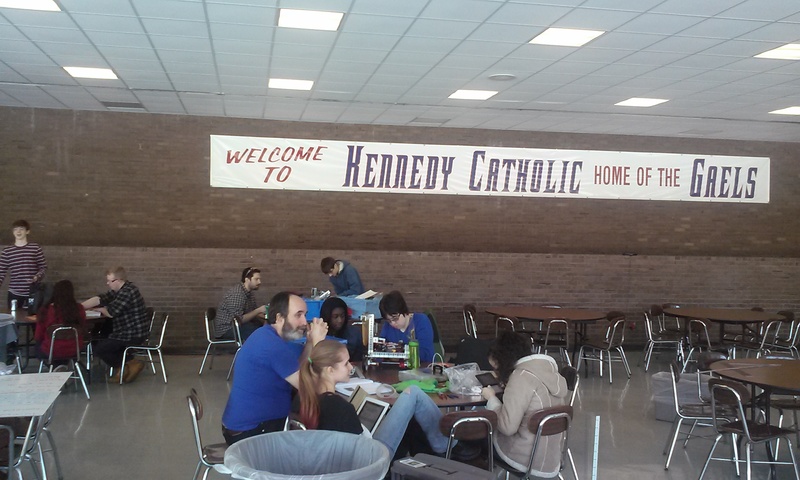 On Thursday, we met to refine our autonomous program. Our previous mode involved rolling off the ramp, scoring in the 60 cm goal, and moving that goal to the parking zone, all for a total 70 points. After the meeting, our mode was able to roll off the ramp, score in both the 60 cm and 30 cm goals, all for 80 points. This all took 24 seconds, so we hope to squeeze in parking a goal as well to bring the total score up to 100 points! On Friday, we met to finish up our new harvester. The design in a plastic/aluminum column that would be able reach all goals, including the elusive 120 cm. A sweeper collects from the floor and it has one-button programming to reach certain tube heights. Finally, we demoed at the Hudson Valley FLL Championship with fellow FTC teams 5997 SuperUsers, 6567 Roboraiders, and 9541 Xeno Gaels. It was a productive day for us as we were able to make our new harvester operational plus issue robot drivers’ licenses! All in all, it was a great day of fun with friends new and old. Today we met to decide the course of our future! After careful thought, we have agreed on withdrawing our spots in the New York/ Long Island and New Jersey Regional Championships. This way other teams may have a chance at another tournament. By withdrawing, we are looking at extra time to revamp our design. 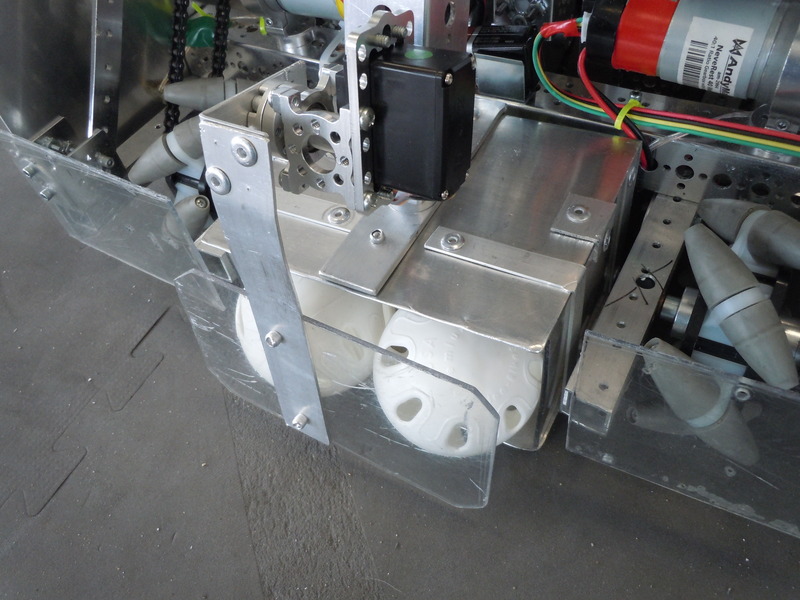 Without going into the specifics just yet, we hope to change our harvester to allow us to collect 5 balls and dispense them both in front of and behind the robot. We also think our new design will give us the capability to not only score in the 120, but be able to do so totally automatically. Other advantages to withdrawing are that we may cram in some other outreach events for the coming weeks. 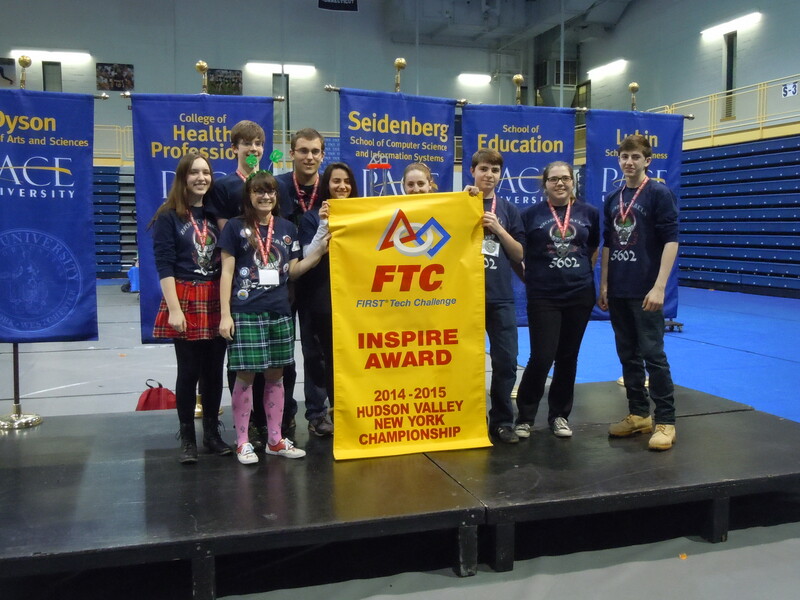 Our ideas include demoing at the Microsoft Store in Danbury, CT and at the FLL Hudson Valley Championship and volunteering at one of the championship events we withdrew from. We also look to hold a scrimmage with local teams to prepare us for the East Super Regional. If you’re interested in joining us at a demo or playing at our home turf, shoot us a message! We’re looking for all the friends we can find! Yesterday we kicked off the championship season at the Empire NY Championship at Pace University’s Pleasantville campus. We had a tremendous showing! With great partners, we were able to create a 5-0 qualifying record. Our strengths had to be our offensive autonomous mode (which only missed finding the rolling goal once! ), our ability to reliably fill the 60 cm goal, and our speed in moving the goals up the ramp. 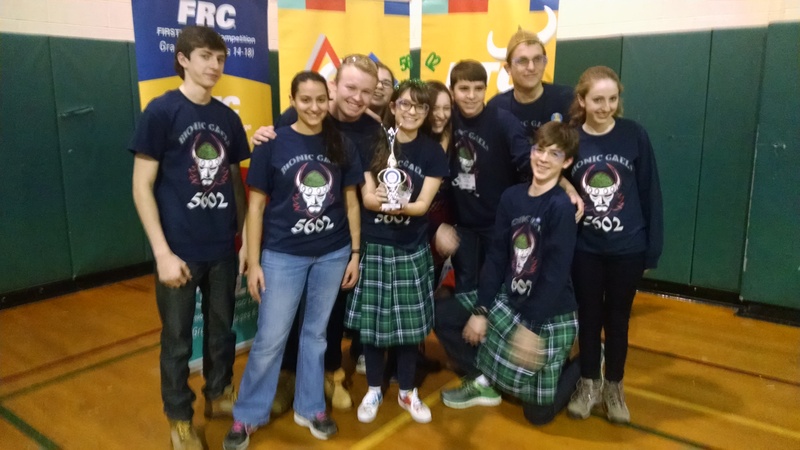 We were 2nd Alliance Captain and went into the elimination rounds with partners 7012 error 404 and 4107 Mohonbots. In the semifinals, we lost two out of three matches, but we certainly gave the 3rd Alliance a run for its money! The matches were so close we couldn’t even predict the results! During the Award Ceremonies, we were named a finalist for the Control and Think Awards, and had the tremendous honor of winning the Inspire Award. What a day! East Super Regional, here we come! Many thanks go out to our great elimination partners, all of our qualifying partners, and the gracious volunteers. Congratulations to 6081 i²robotics, 4174 Atomic Theory, 8391 W-Prime Robotics, and 7487 Super 7 for advancing! Check out our Facebook album as well! Yesterday we went to compete at the Lower Hudson Qualifying Tournament hosted by team 9094 EDISON Robots at Yonkers Riverside High School. We had a great day of competition, coming out of qualifying matches with a record of 2 loss, 2 win, and 1 tie. 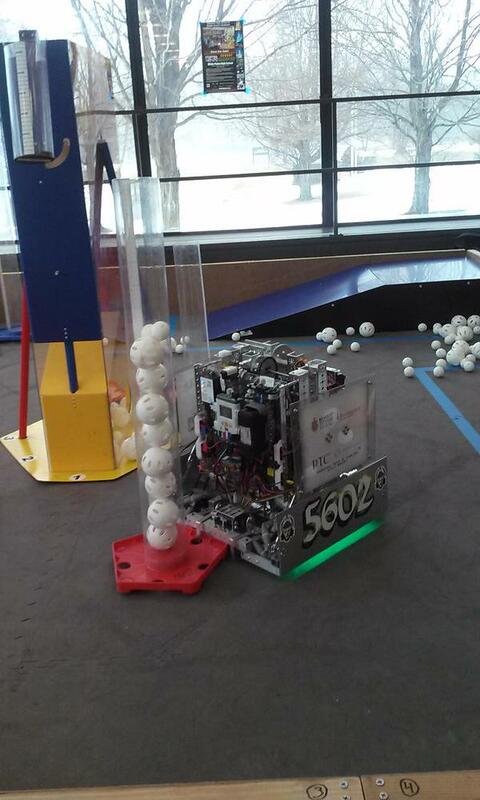 Our robot was at its best, as we made modifications this past weekend to put on last season’s scoop, which allowed us the height to score not only in goals attached behind the robot, but also into the 90 cm goal. Recognize Scraps’s scoop on PT-109? After the morning matches, we were chosen by the fourth alliance captain 4244 Robusters, of Yorktown BOCES, along with 9605 Excelsior, of Excelsior Academy in Newburgh. We lost both of our semifinal matches to the first alliance, however we were still proud of our performance. In the awards ceremony, we were named a finalist for the Control Award (the second time this season!!) and were honored to win the Inspire Award (again for the second time!). We congratulate all teams that played today! Special congratulations go out to our friends at 9541 Xeno Gaels, 18 Techno Chix, and 4654 Jellyfish for advancing! See you all at Pace!